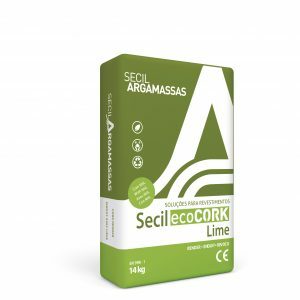 ecoCORK by Secil is a lightweight insulating render, formulated with natural cork aggregates, sands and natural hydraulic lime (NHL). ecoCORK uses a blend of cork and natural hydraulic lime and, as a result, is a sustainable, ecological building product. This mortar blend therefore contributes to the improvement of thermal and acoustic insulation. Specially formulated for spray or manual application equally on to solid walls internally or externally. An insulated render with improved thermal and acoustic performance. Natural hydraulic lime binder (no cement!). Improved curing times (an overall speedier application). Apply a hand harled coat of Consolidation Mortar @ 3 mm to provide a physical key for the ecoCORK coat. A day or two after the Consolidation Mortar has been applied, apply the ecoCORK at a thickness of up to 20 mm, incorporating a 4 mm fibre glass mesh bedded in between to minimise the possibility of cracking (i.e. 2 x 10 mm passes). Float the surface after a few hours to prepare for the Finishing Render. Let the ecoCORK harden for a few days before applying a final coat of Finishing Render at approximately 4 mm thick (2 x 2 mm passes). If you are applying ecoCORK internally, an additional top coat of traditional lime plaster or clay plaster can be applied for a fine finish. We strongly advise the use of Silicate Primer followed by 2 coats of Silicate Paint externally as a protective finish on ecoCORK. Secil ecoCORK Lime EN 998-1:2010 Light weight mortar (LW) and of Thermal Insulation (T) for internal and external coatings. Declaration of performance TC.E.0988. You will find a wealth of information about how to use our products on our website. We are also happy to give advice on the telephone or via email. Customers can also obtain additional independent advice from SPAB and LPOC.